I like to start the new year with silence. After all the spending and eating and visiting and not-sleeping of Christmas, the first week of January is one long exhale. No-one’s doing any real work (don’t pretend that you are) and so the emails are quiet, the phone isn’t ringing. It’s a good time to be still and take stock, be it of the bank account, the state of one’s business, plans for the year ahead or perhaps more weighty spiritual matters. Outside is quiet too. After a remarkably wet and warm December, the temperature has dipped slightly (but only slightly) and we sit under heavy grey skies. Briefly the sun makes its presence known, before sliding back under its clouded blanket. The daffodil bulbs, confused by this warmth, are poking their heads up and I wonder if they will be damaged by the wind and chill that will surely soon come. 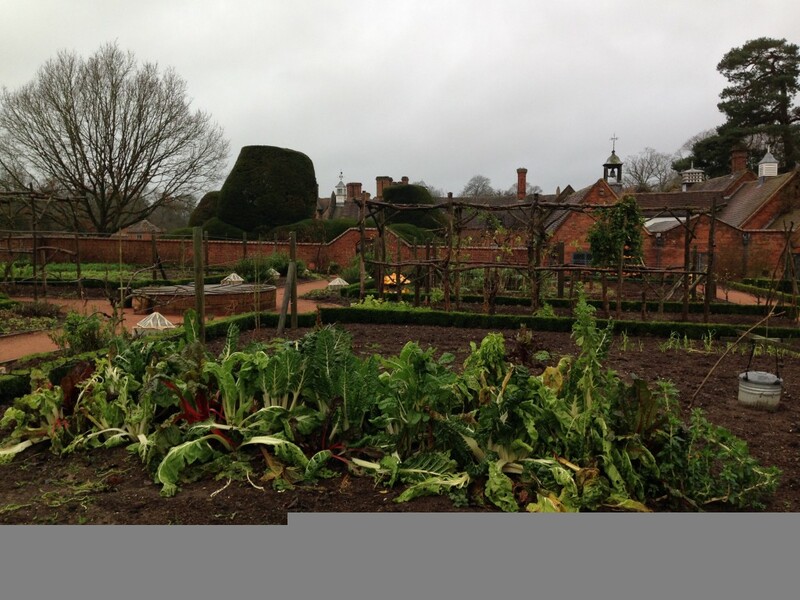 Last weekend we popped to Packwood House in Warwickshire for a fortifying lunch and afterwards wandered around their walled kitchen garden. The crab apple espaliers give structure even in this quiet time, and the chard does its best to bring drama to the beds. 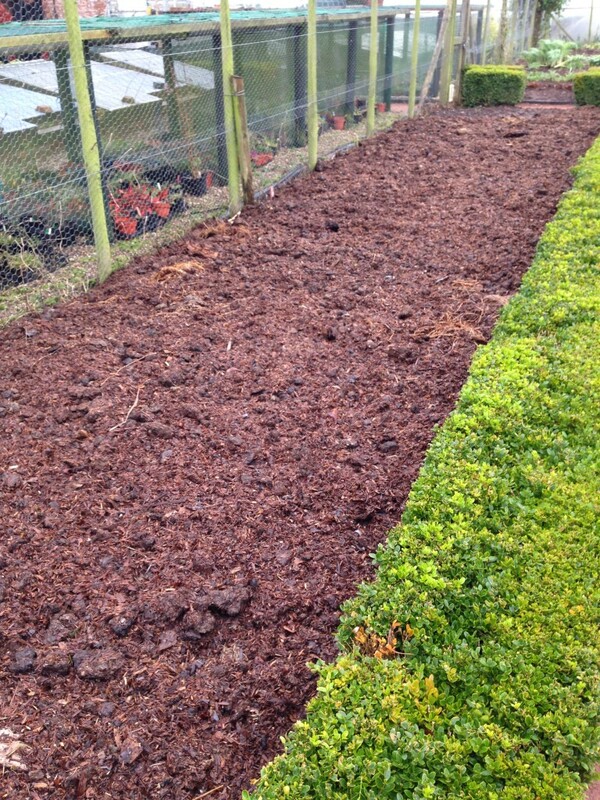 After our manure adventures over Christmas I appreciate any well-mulched bed. This one is a beauty and puts our oh-it-will-do approach to shame. Summer, autumn and winter do not always follow a fixed time-frame, preferring to run to their own rules. 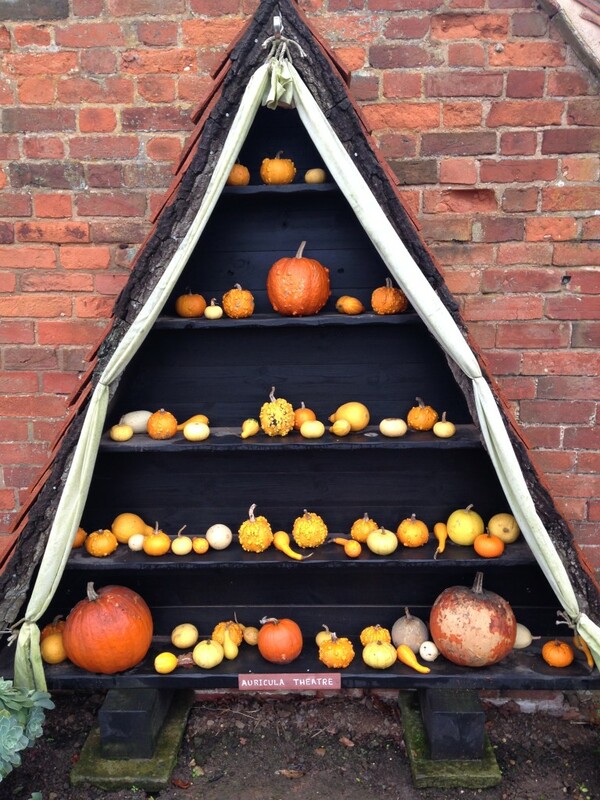 There are still roses in bloom now, albeit husks of their former selves, and at Packwood the pumpkins and gourds give a splash of Halloween colour – in January. Given my quiet and frugal state of mind, January is a good time to indulge in a bit of bread baking. Firstly, it stops you going to the shops to buy a loaf (and when your nearest shop is M&S Food, as mine is, the only cost-effective option is to simply avoid. Really, who goes to M&S and leaves with just bread?). Secondly, baking is such a simple, wholesome task, one can’t help but feel grounded. So today it’s soda bread, the easiest of the lot. 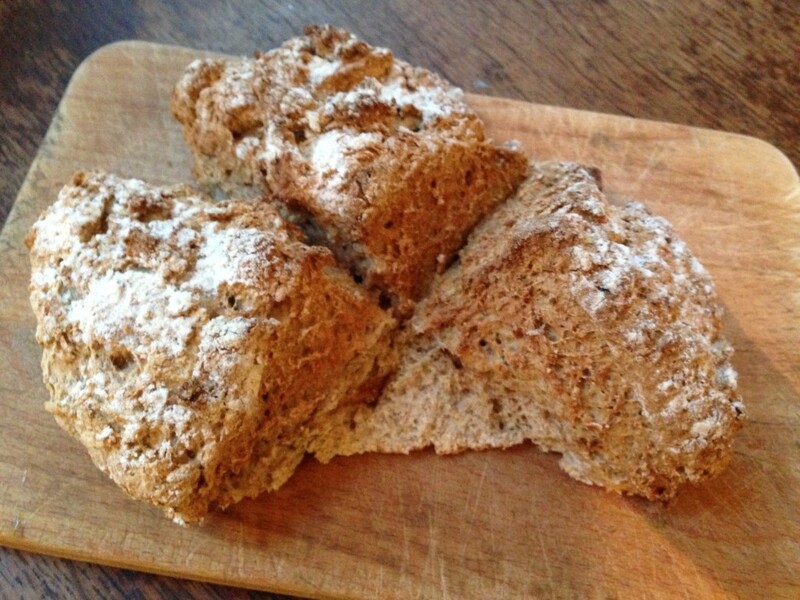 When you need a loaf quick, either for supper or to have with soup, then soda bread is your friend. All you need is flour, salt, bicarbonate of soda and buttermilk or yoghurt, and if you want you can then add cheese, grated root veg, treacle, herbs, seeds, whatever you fancy really. It can be mixed in less than 2 minutes and on the table within the hour. The science is this: acids in the buttermilk (or yoghurt) react with the alkaline bicarb, creating carbon dioxide, which makes the bread rise. That’s the theory. However, I’ve started using a mixture of plain and self-raising flour in my soda bread, cutting down on the bicarb. Self-raising flour has bicarb AND cream of tartar in it (this mixture is usually known as baking powder) and therefore responds to heat as well as liquid. You get a double lift effect, the first when the buttermilk hits the flour, and the second when the heat of the oven gets into the dough. I think this approach gives a fluffier result and avoids the risk of bitterness, which you can get with too much raising agent. So this recipe is not traditional…but it works for me. Serve warm from the oven with lashings of cold salted butter. Preheat the oven to 200c and line a baking sheet with baking parchment. Tip the flours into a big bowl and add the salt and bicarb, mixing to combine. Tip in the buttermilk or yoghurt then using a scraper (or your hands) stir to combine. You might need a little extra milk – we’re looking for a dough that holds it’s shape but isn’t unmanageably sticky. Work the dough with your hands for mere moments – we’re not kneading here, just bringing it together – then shape into a loose ball and place onto the baking sheet. Dust lightly with flour. Take a sharp knife or scrape, cut a cross-shape almost down to the bottom of the loaf. Bake for about 40 minutes, until the base sounds hollow when tapped. Cool for five to ten minutes before serving. 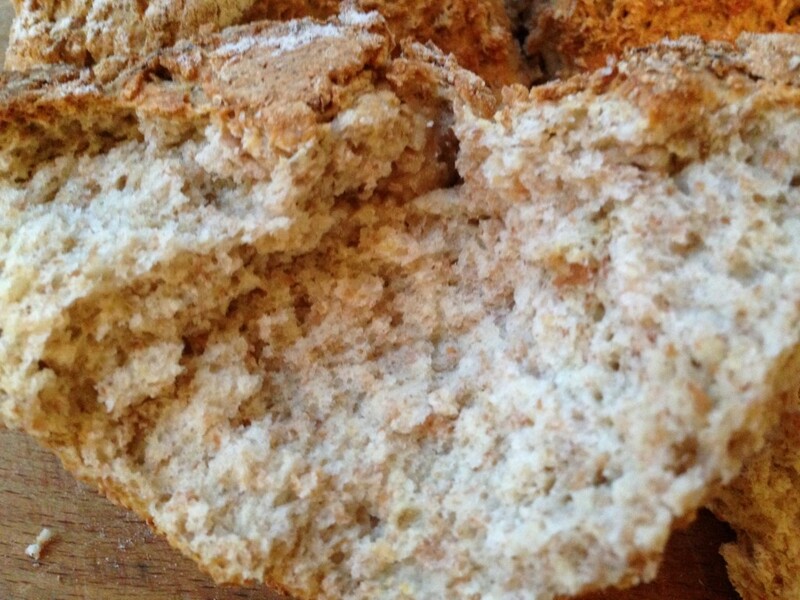 This entry was posted in Recipes, Savoury and tagged soda bread, wheaten loaf. Bookmark the permalink.